I've switched to Gnome on my EEE 901. Things are running fine now. I'm curious, if a lot of people use Gnome here, and if so, how does it look! Archers seem to love more lightweight solutions like Openbox etc... Or KDE. 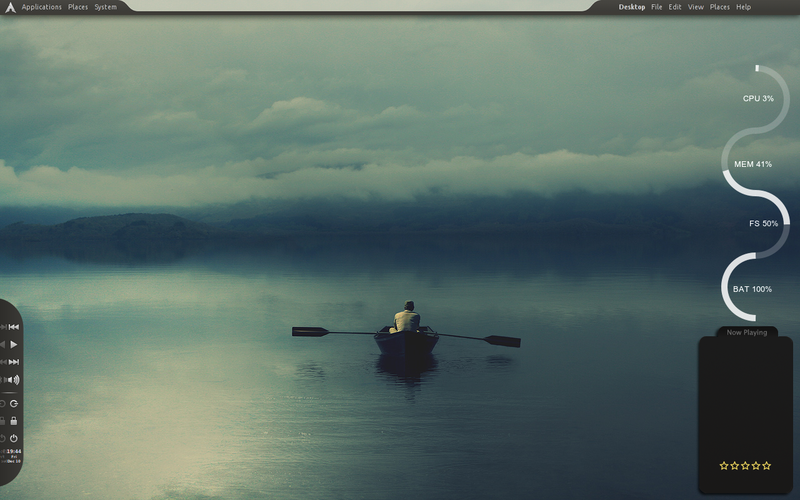 I run Gnome on my desktop daily basis and I'm fully satisfied. I'm planning to move to Gnome 3 if it comes out. I liked and used KDE when the version was 3. After 4 came out, it disappointed me and now I don't want to go back, at least now. I'm too lazy these days to hassle with GTK/Metacity themes. OOB experience is enough for me -- working fast stable desktop. There are plenty of threads around for different DEs/WMs . Exactly, but none for Gnome! Like mentioned, it's Archers go for more lightweight stuff. Hehe thanks Sven. Sure no probs, just give me a few minutes to dig it all out!! ..........heads of into the depths of his home dir!! How did you manage to get that Firefox menu to be on top and separated from it's own window? 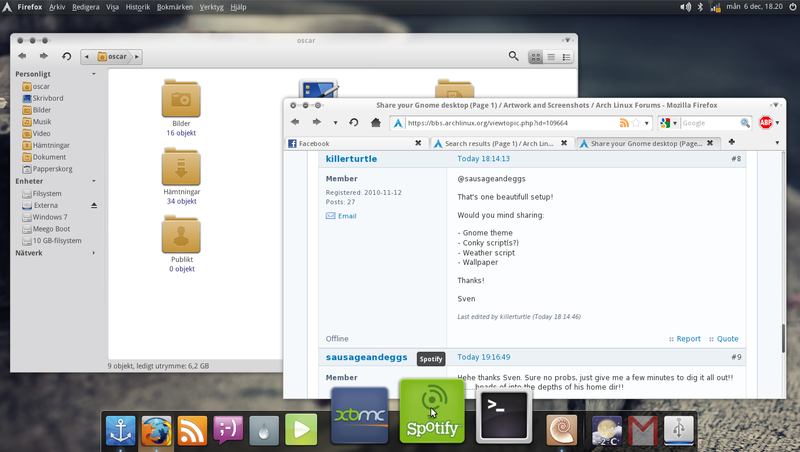 Here you go Sven, the Gnome theme is elegant gnome with nautilus elementary. Window decoration is an emerald theme, I've put that, the wallpaper and all the conky stuff in a tarball for you to grab. You'll need a couple of other pkg's installed if you want to get conky exactly the same, details in the tarball. How do you make your fonts look that nice??? I use the Liberation fonts package (ttf-liberation) from the community repo. The font in the terminal window is Liberation Mono @ 14 points. Thanks! But I mean, what are your font settings? Could you post a screenshot with the settings window open? Wow! Teh care to share some details on your setup? Also, isn't Tijuana the city Bender comes from? This is my signature. If you want to read it, first you need to agree to the EULA. gnome-globalmenu in the gnome menu. 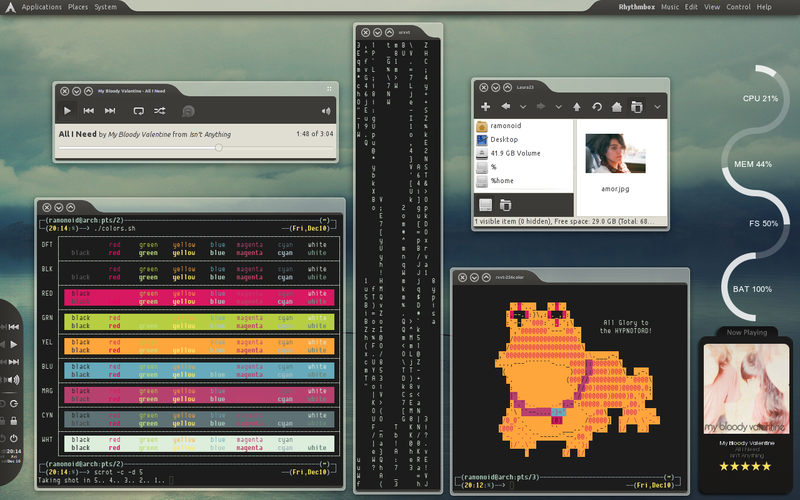 The apps in the second screenshot is just PCManFM-mod, rhythmbox and urxvtc showing cmatrix and ascii hypnotoad.